I hope you have enjoyed the Summer so far and are spending time outside to get the much needed Vitamin D. It has been rather dry till we had the lovely rain the other week. However, the drought doesn’t seem to have been too severe and a copule of the lovely herbs I will talk about in this Newsletter are still in bloom. These are: Oregano (also called Wild Marjoram) and Red clover. I do hope you will be able to identify them on your walks in the fields. Olive leaf, is the third herb discussed in this Newsletter, for those who are off to a lovely Mediterranean holiday; you will never look at this beautiful tree in the same way again! Identifying this wonderful medicines in their own habit can contribute to developing a much closer relationship with them and with nature itself. Our senses may start to become more sensitive and in tune with what is around us, especially our sight, smell and touch. In ancient times, mankind had a much closer connection with nature. Through this close relationship with the plant kingdom, a great knowledge and wisdom developed and till to date we benefit from such knowledge, in particular in the area of medicinal plants and their properties and uses. Ancient traditions of medicine such as Ayurveda which is over five thousand years old, evolved as a natural consequence of this intimate relationship with the plant kingdom and natural world around us. We have largely forgotten how important plants are. Plants take a lead role in this mysterious play of life, providing, in one way or another, most of our clothes, our shelter, our foods and our medicine. Re-engaging with the web of life may improve the future for us all. The Name Origanum originates from two Greek words; pros (mountain) and ganos (Joy) allusive to its happy appearance these plants give to the hillsides on which they grow. It is a perennial herb and is distributed over Asia, Europe and North Africa; it grows freely in England, in particular in the south-east and south-west. It flowers from the end of June, through August. Oregano has a very ancient medicinal reputation. The Greeks used it extensively, both internally and externally for fomentations (heating / cooling compresses). Among both the Greeks and the Romans, it was the custom to crown young couples with oregano. In England the flowering tops were used to dye woollen cloth, and before the introduction of hops, it was very much in demand for ale-brewing. The main source of its medicinal properties are the essential oils which are found in the leaves, but for medicinal purposes, the whole aerial parts are used. These essential oils work in synergy with the plant’s additional constituents, and make Oregano a very useful medicinal plant; it is now very much part of the Western Tradition of Herbal Medicine. Studies have found that Oregano has many beneficial properties. As an anti-microbial, it has been used for the treatment of chronic candidiasis and other types of fungal infections. It also has been used for the treatment of indigestion, heartburn and low stomach acidity. Additional treatments include: yeast infections, colds, flu, coughs, chest infections, sinus congestion, nausea, hay fever, and so on. Research has also shown that oregano inhibits the growth of Candida albicans. The anti-microbial and anti-fungal properties of Oregano stem from its essential oils. A simple way to take Oregano is by making a tea. This can be made with the fresh or dried herb using approximately 1 to 2 teaspoons, steeped in hot water for approximately 10 minutes (with a lid on). Take this dose up to three times daily. Herbalists will use it in the form of a tincture in a herbal formula, in which it will work in synergy with the other herbs. Oregano oil can be applied topically for the treatment of microbial infections such as athletes’s foot among other fungal infections. The oil needs to be diluted by 50% or more, typically in a carrier oil such as almond, prior to application. The oil should not be used internally as there could be safety issues. Precautions: Essential oil of Oregano may irritate the skin if used undiluted. Avoid during pregnancy and known allergy. 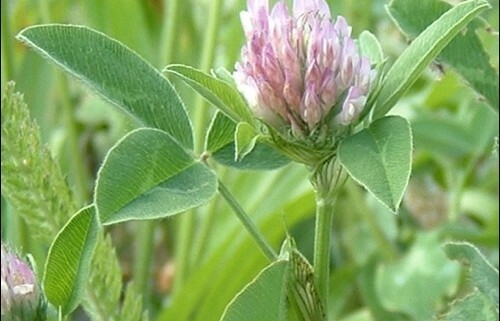 Red clover is a perennial plant and is native to Europe, Western Asia and Northwest Africa. In the 1930s, it was a popular anticancer remedy and may still be used for such treatments to date. Folklore: Each of the leaves of a normal three-leafed clover was said to represent one aspect of the Triple Goddess; one was the maiden – the young woman; one the mother – the fertility symbol, and one the crone – old age and wisdom. The parts used for medicinal purposes are the flower heads, which can be gathered between the Spring and early Autumn. It has been used to treat cancer and tumours in general, and also skin diseases, syphilis, bronchitis, fevers, colds and inflammatory conditions associated with arthritis and gout. Due to its antispasmodic and expectorant properties it makes it a useful herb for coughs, especially whooping cough, and other diseases associated with mucus congestion. A strong tea is indicated as a gargle for mouth ulcers and sore throats. It has been used topically to heal fresh wounds as well as old ulcers and makes an excellent healing salve. For scaly skin, a strong tea can be used as a wash or an ointment of the herb can be applied. As a poultice or cream, it can be used to soften milk ducts for nursing mothers. In my clinic I have used it with success as a blood cleanser for chronic deep-seated skin conditions such as psoriasis and eczema. However, the greatest success I have had with this amazing herb is in using it in formulae to balance hormones, in particular for peri-menopausal, menopausal and post-menopausal women. 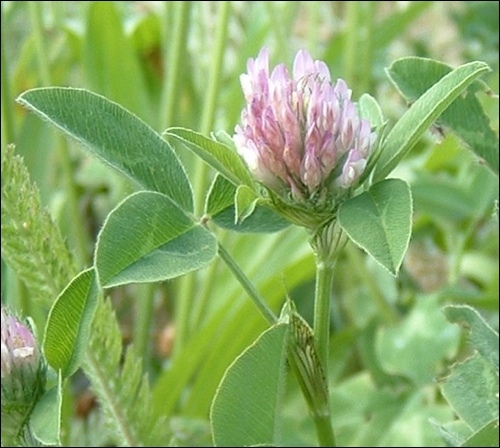 Red clover is one of the richest sources of isoflavones. This constituent (phytochemical) has oestrogen-like effects. Studies have show that it activates the oestrogen receptor sides in the body, hence influencing the balance of this hormone. It is one of my very favourite herbs to be included in my hormone balancing formulae to treat hot flashes, PMS, breast enhancement and all related hormone imbalance symptoms. It is also a source of many valuable nutrients including minerals and vitamins. Legend has it that in ancient times, the olive tree was held in such a high position that Moses exempted from military service men who worked at its cultivation. The oil, in addition to its wide use in diet, was burned in the sacred lamps of temples. It was a symbol of purity and goodness and the tree was a representation of peace and happiness. In Greece, the champions of the olympic games were crowned with the leaves, and it is the leaves that are still used to date in herbal medicine. Olive trees are native to Asia Minor and Syria, but are cultivated throughout the Mediterranean countries and also Chile, Peru and South Australia. Olive leaf was first used medicinally in Ancient Egypt. The more recent knowledge of the olive leaf’s medicinal properties goes back to the 1800s, when the leaves were used as a drink to reduce fevers and treat malaria. Olive leaf is the leaf of the olive tree (Olea europaea) and to our knowledge, was first used medicinally in Ancient Egypt. It is gaining recognition as a powerful medicine against many conditions of ill health and numerous scientific studies have been conducted to investigate its beneficial properties. The medicinal benefits of olive leaf range from promoting increased energy and healthy blood pressure, to supporting the cardiovascular system and the immune system. In herbal medicine, the leaves are used for a huge variety of conditions. As an anti-microbial, it can be used to treat bacterial, fungal and viral infections. In my experience it is very effective as an immune booster, and I use it either on its own or in immune boosting formulae as a preventative for flu and colds, in particular during the winter months. It can, however, also be effective in shortening the duration of viral infections such as flu. Olive leaf has been used to treat urinary infections, and indeed many other infections in the body caused by fungus or bacteria. As a hypoglycemic (low sugar levels in the blood), it can help stabilize blood sugar levels. It has a bitter taste, which can enhance the flow and production of bile and enzyme production from the pancreas, both of which are important for an optimal function of the upper digestive system. In my experience, it can be a great herb to treat adrenal exhaustion, and I have used it with great success in formulae for this condition. In the stressful world of the 21st century there is no shortage of people who suffer from adrenal and mental exhaustion. From books of herbal medicine we can read that it has been a very popular medicine for years, and has been used for the treatment of hypertension, to dilate coronary arteries and improve blood circulation although in my own clinic I have not used it for these conditions. Our next newsletter should reach you in the Autumn. Enjoy the rest of the Summer!